An artist's impression of the dust surrounding a red giant star. When middleweight stars near the end of their cosmic lives, they shrug off their outer layers, shedding up to half their mass. But just how the stars manage to dispel so much material has been a mystery, though a new study may hold clues to closing the case. Astronomers sifting through new observations have found that dust grains in the outer layers of atmospheres of near-death stars are surprisingly large. The process, researchers say, allows the star dust to deflect light and skim out of the way, transporting their mass into space. The revelation helps fill in the details on an important process that shapes the evolution of galaxies. When the first stars were born, they were made almost exclusively of hydrogen and helium, the two lightest elements. Inside the cores of these stars, these elements fused to form heavy elements such as carbon and oxygen. Then, as the stars got older, they expelled these elements into space as they lost mass, ultimately seeding the galaxy with the raw materials for new stars. 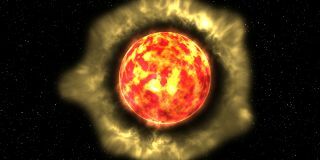 The new stars were then born with heavier elements, which allowed them to create ever heavier elements through fusion inside their cores. And the cycle continued. "We wanted to know, how does it happen, how does the star eject most of its mass into the interstellar medium?" said Sylvestre Lacour of the Observatoire de Paris, one of the researchers behind the new study. "We were trying to look very close to the star to see what is the engine pushing all this matter out?" During what's called the red giant phase, which can last 10,000 years, stars lose so much mass that all that remains are their leftover cores. They are also extremely bright during this time, releasing copious amounts of light in the form of photons that zoom outward in all directions. Astronomers reasoned that this light must be pushing mass, in the form of grains of dust, out of the star, but didn't understand how that could be. The researchers, led by Barnaby Norris of the University of Sydney in Australia, used the Very Large Telescope in Chile to observe the dust shells around three red giant stars. "We found there's lots of dust, much more than we expected," Lacour told SPACE.com. "It looks like the grains are transparent enough so they are not destroyed, but they deviate the light." The dust grains were larger than expected, with an average radius of about 300 nanometers (a nanometer is one billionth of a meter, or about one ten-thousandth the width of a human hair). "It sounds small, but in fact it's quite big" in such an extreme environment, Lacour said. In fact, the dust grains seemed to be of a size close to the wavelength of the light pouring through the stars. This allowed them to resist being hit head-on by the photons, but instead caused the photons to dodge by, and through the interaction, push the dust grains on a new course outward. "For the first time we have a new way to push the grain," Lacour said. "The grains are not pushed because a photon is hitting the grain, and pushing it. The grain is pushed because it deviates the light and through this deviation there's some transfer of energy that pushes it away. That's how the grain can survive." Dust grains forming in the atmosphere of a cool luminous star are accelerated away (white arrow) from the star through absorption and emission or scattering of stellar photons. By subsequently colliding with molecules in the surrounding gas, the grains accelerate the molecules, make them collide with other gas molecules and trigger an outflow of gas, or stellar wind. Norris and colleagues’ study of the immediate vicinity of several cool giant stars provides information on the sizes and material properties of the grains that drive stellar winds. The discovery was enabled by measurements taken in polarized light, which uses a filter to look for light waves oriented in certain directions. This process revealed different images of the stars in different polarizations, hinting at the size and behavior of the dust grains relative to the light. "This result was made possible by a clever combination of advanced instrumentation and observational methods," astronomer Susanne Höfner of Sweden's Uppsala University, who was not involved in the research, wrote in an accompanying essay in Nature. "This result confirms the pre­dictions of models that explain how gas can escape stellar gravity and become part of the cosmic-matter cycle," Höfner added. Though one question about red giants may now be answered, it raises others in its wake. "We don't know how these grains appear," Lacour said. "We were not expecting these grains to be so large there, and we still do not know how they can form. That’s the next mystery to solve. How can we have such large grains so close to the star, inside the atmosphere?" The new findings are detailed in tomorrow's (April 12) issue of the journal Nature.